"The grasshopper flew, flew and landed, rested a bit, ate everything and then flew off." The interest in insects originated in ancient times. Humans have long since been confronted with the damage caused by pests and they have also sought the useful. In Assyrian cuneiform tablets and in Egyptian papyri dating from the 3rd century BC the devastating attacks of locusts were mentioned. In ancient Chinese manuscripts from the same period there is evidence about the breeding of silkworms and the fight against garden pests. Since that time, the branch of science called entomology was developed. Entomology (from the Greek Éntoma - insects and technology) is the science of insects as extensive part of zoology. These are very harmful insects in agriculture. They are classified according to their food. There are polyphagous limited- and mono-eating animals. The most damage is caused by polyphagous, for example, the grasshoppers. Here is a description of a plague of locusts in Morocco, which was described by one skilled in the journal "Science". He wrote how he felt unusual one morning while walking. There something strange happened with the trees. They changed the color from green to red. On closer inspection of the trees the scientist saw that everything was covered with a moving mass. There were locusts. The mass was moving and caused noise. It was found that it was the noise of the falling waste products from the "chewing flock". The plague of locusts is considered one of the worst disasters in agriculture, comparable to a natural disaster. The swarms of grasshoppers searching for food per day can cover a distance of over 30 km away. On their way the insects devastate agricultural fields, eat all the plants up to the roots, leaving only barren land. After the Grasshopper have destroyed everything, they fly to a different location. During mass production the number of individuals reach up to several hundred or even a thousand per square meter. According to the Ministry of Agriculture of the Russian Federation on June 17, 2009 large areas of infestation with locusts were already established on 330,900 ha in Southern Federal District of the country. A particularly serious situation has arisen in the Astrakhan region. By a plague of locusts 50,000 hectares of farmland were affected in nine of the eleven districts of the region, so that an emergency state was proclaimed in the region. Despite all the measures that have been taken at government level, in 2014 the damage was caused by the locusts, according to expert estimates, about 1 billion Rubles. What will happen this year, no one can predict, but experts agree that the amount of damage is highly unlikely to be lower, despite the measures taken. In Kazakhstan, the cost were about the same. According to the Food and Agriculture Organization, the annual losses amount to about 20-25% of the possible global harvest of crops. As in the past, unfortunately, farmlands are treated from the ground or from the air with different chemicals. The tactics of the destruction of grasshoppers after hatching with chemical agents is virtually ineffective because individuals die after a few days after the poisoning. During this time, the locusts are causing significant damage of the surrounding vegetation. 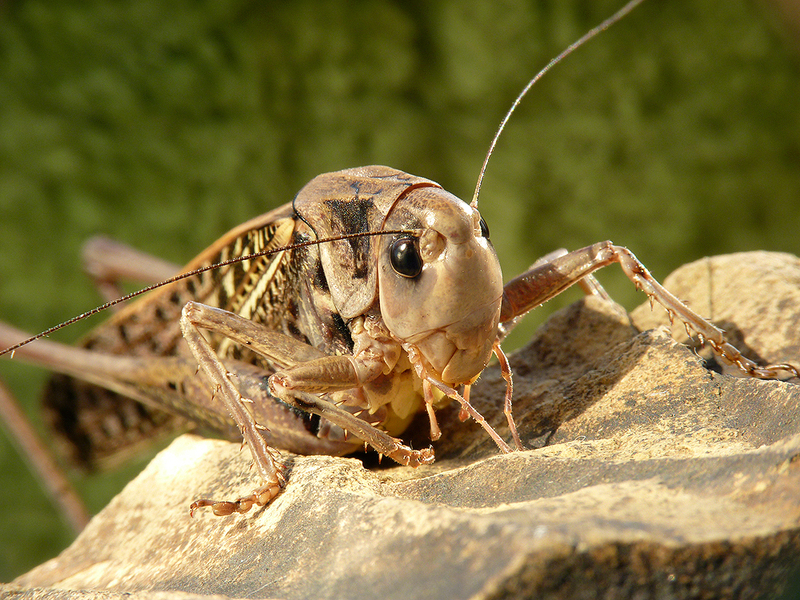 Thereby the plants that should be saved from the grasshoppers are destroyed with the chemicals (or poisoned). Thus, it is believed at this time that locusts can be fought only in the stage of egg laying, but this technology has not yet been invented, and it is researched by one of them. It is confirmed by the experts concerned that the locusts are mutating from year to year and the methods that were effective yesterday nowadays show no real effect in pest control, But science does not stand still, and today we have found an electromagnetic method of combat against plague of locusts. And not only this, but also against Colorado potato beetle, mole cricket, aphids, grapes and other pests. EME-waves (electromagnetic units) affect a swarm of locusts at different times of their daily cycles. The daily behavior of a swarm looks like this: After sunrise, the landed swarm for the night is heated in a compact form about 2 hours in the rising sun and this case raising up some animals out of the flock, flying over the seated main field. The entire swarm is rising up over the next two hours also in the air. In flight active parts of the swarm are repeated landings and take-offs, resulting in a continuous rotation of the insects. In addition to fighting plagues of locusts and other pests at the request of our customers EME, when configured substantially can increase agricultural productivity. In this case, labor costs, fuel, fertilizer and financial resources are reduced, without recourse to genetically modified plants. Our technologies affect the plants and lead to the activation of their life force. The use of technology allows, even in the course of the first year, a real growth of productivity in several reducing the consumption of fertilizers and herbicides. It returns true fertility and the humus layer are built up. The method allows to activate the vital activity of the microbiological properties or suppress. Stopping the growth of pathogenic organisms, for example, by in disinfecting the production, the extension of the shelf life of agricultural products, water treatment, decontamination of waste disposal toxic feed, fight diseases and agricultural pests and in the treatment of most diseases animals (including leukemia in cattle) etc. The technology is environmentally friendly and harmless to humans. It has been already tested in Russia and abroad. The proposed technology is the result of years of work by a group of experts, whose goal was to solve the problem as soon as possible, to manufacture environmentally friendly products while reducing the costs. Prevent the impending ecological catastrophe, a faster improvement of the human environment through water and air purification, restoring the fertility of the earth to produce ecoland.